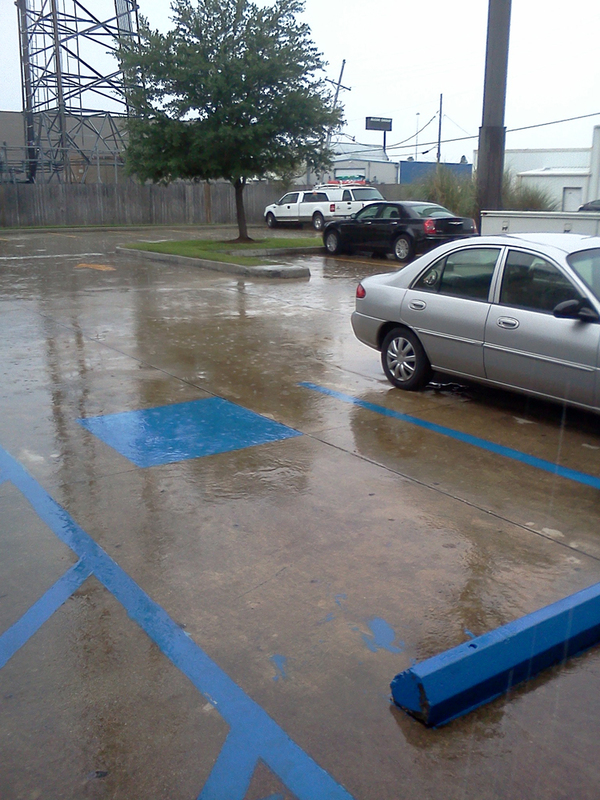 Ah, there’s the rain. Finally. 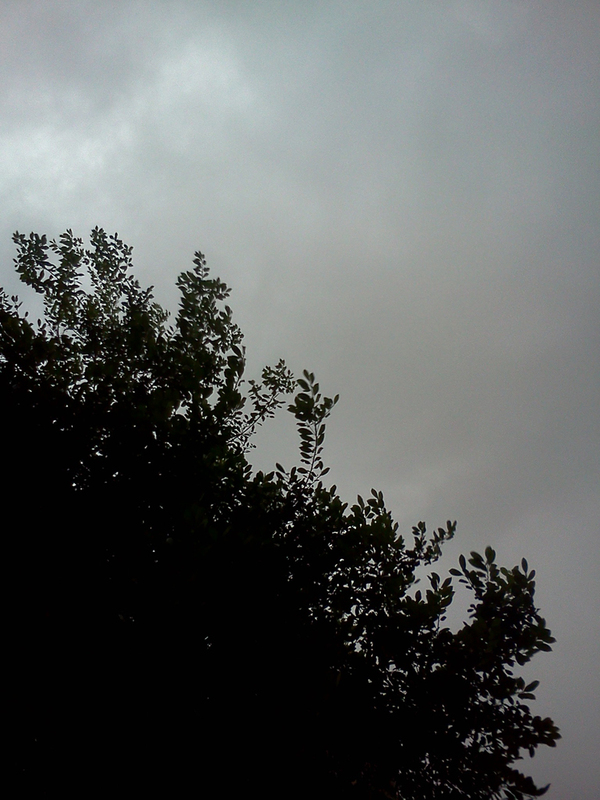 I woke up this morning with a very relaxed sense of calm, to a grey sky and 50-degree weather. Happy to wake up on my own volition, instead of to my alarm (although there are worse things to wake up to than Basin St. Blues or Billie Holliday), at a healthy 8:00 a.m. instead of 4 or 5:00, I would have remained prostrate in bed, burrowed under blankies, were it not for the agony of painful stiffness in my lower back. I would feel better if I got up and moved around, and so I did. And have had a rather cozy day of it. I cherish my one day off a week. I wish I had two, but I’ll take what I can get, and revel in the fact that my manager at the restaurant job is quite thoughtful, and makes absolutely certain that I do indeed get that day off every week, lest I go mad and also physically fall apart at the hinges. The joy of The One Day Off commences the evening before, when I realize I do not have to rise before the sun. Last night, in epic celebration, party animal that I am (much unlike Saturday, when we did indeed get to see our tribe at the camping event, hurrah, and much celebratory imbibing ensued), I stayed up later than usual, drawing and painting. The paintings are now on The Wall, which I swear I will share eventually, as it fleshes out further. I then trundled to bed and continued reading Julie and Julia until I conked out, sometime before J got home from work, because I don’t remember him coming in. And now, the cozy day. I got the un-fun stuff out of the way first. Paycheck trip to the bank, bill paying. That sort of thing. Then we all had a cozy-day lunch of beef stew over mashed potatoes, watched a Sherlock Holmes film (not the current sacrilegious ones that have come out recently that have nothing to do with what Mr. Conan Doyle wrote, but the older ones with Jeremy Brett that do the stories absolute divine justice). Something about those episodes and films…mayhap Mr. Holmes’ voice, or the constant foggy London scenery, or simply a general vibe…always, ALWAYS, knock me out. So, nap I did. Upon awakening, I finished Julie and Julia and here I am, awake and London-foggy and happy that, after hearing the teasings of thunder for about an hour, I just heard rain begin to come out of the sky. However, in the time it has taken me to write the above, it has stopped already. Sheesh. The frog-strangling torrents I celebrated in Louisiana are a long way off now, it seems. Up here, it shows up, dries before it hits the ground, and there ya go. Down there, this sight means many impending puddles to either jump in or avoid, depending on what kind of shoes one is wearing. And it sticks to the ground. Insert big huge sigh here! This shot was taken from The Room in Louisiana. A view I don’t miss, particularly, but the location, yes. Nevertheless, despite our rain’s refusal to stick around and hang out awhile, it’s still crisp and autumn-like today, in that crisp way that crisp Colorado fall days can be, and I will enjoy it whilst I can, when they happen, before we hit the road again. Much like I’ll continue to enjoy, while I can, the fact that the cold tap in the sink actually runs cold water. And that a wet towel, if accidentally forgotten on the floor, will still actually dry. One must enjoy the Little Things wherever they find themselves to be, I suspect. Productivity complete, film watched, stew munched, nap napped, book finished, I’m all awake and restless now. So I decided to write. About what, I wasn’t certain. What y’all are reading here is one of those complete train-o-thought sort of entries. Pre planned writing has not appealed to me this week so I figured, what the heck, let’s see where this leads. Anyone read Julie and Julia? It was delightful. And it quite often made me hungry. I admire people who can either cook like that, or who are brave enough to at least attempt it. Within the pages of this delectable tome, I also found some very heartening inspiration. Because there was so much to the author’s life that resonated with mine. In the sense that she kind of followed her crazy, carved her own path. In the sense that Julia herself didn’t find her true life’s groove until she was 37, and things took off well after that, even. In the sense that, in and around the drooling over most of the French concoctions described in the narrative (although I can do without livers and kidneys and aspic, thank you), I picked up the hearty message that paths get carved by living life with joy, no matter what, and that that carving happens in it’s time, and that it is never too late. A lot of hope-y sentiments, to have one suddenly feel so maudlin afterwards, which is what I was feeling before I peeled myself up and sat down to write. I have goals and aspirations and they will happen. What is frustrating, in some ways, is waiting for them to happen. No, not that. Waiting to start pushing them and making them happen. It is SUCH a weird feeling, of the sort that I am hard pressed to describe to anyone who has not experienced it, living in such a transitional state as the one I am living in right now. Enough time has passed that I no longer dwell on how things might have gone. 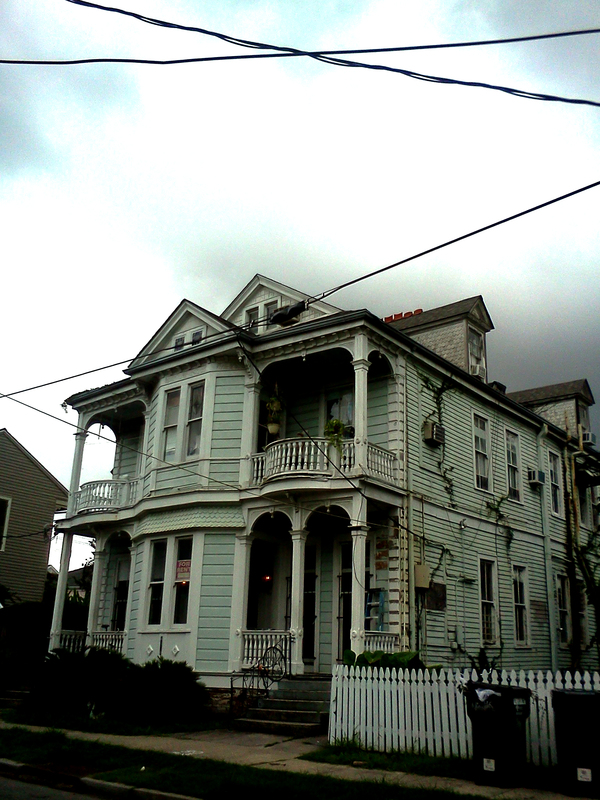 As in, before things stopped working out in New Orleans, we almost lived in this house. In hindsight, I am glad we did not. Our eagerness would have put us in a too-small and rather crampy situation for a year. Our Place is out there, waiting. Rather, I am now, two months and some change out from hitting the road again, looking forward to how things will go. The pursuit of Real Work (this retail thing is killing me, in more ways than one, despite the fact that I do take some joy in it from time to time and am learning a lot and meeting very interesting people) and a home and all of that stuff. Along with a knowledge that I can relax and Be in my heartland and relax and know I’m not uprooting again. An end to transitoriness. With a whole bunch of upheaval and interesting excitement on the way there. Zoom! The process has already been going on. Things in the family house are being packed and put into storage. At the start of September I will actually be re-beginning my New Orleans job search from afar. So, zoom again! At any rate, no maudlin-ness here, now. Writing is amazing for that. Instead, I look forward to things. All sorts of things. Even things that are not life-changing but still on my mind. Like our dear old friend, the Royal Pharmacy. I just went out for a smoke (and discovered that it was sprinkling again, so it ain’t over yet) and found myself ruminating on the good ol’ Pharmacy. I wonder if, since my departure, anyone has opened the doors? Maybe? 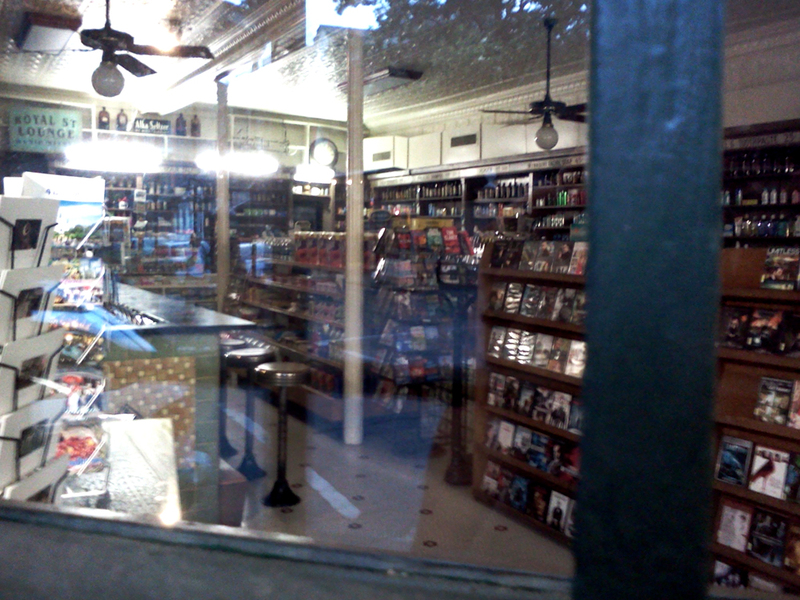 I snapped these last two shots on our epic stroll through the Quarter, our last time there. The lighting was just right to be successful in stealing some interiors, while still locked out. 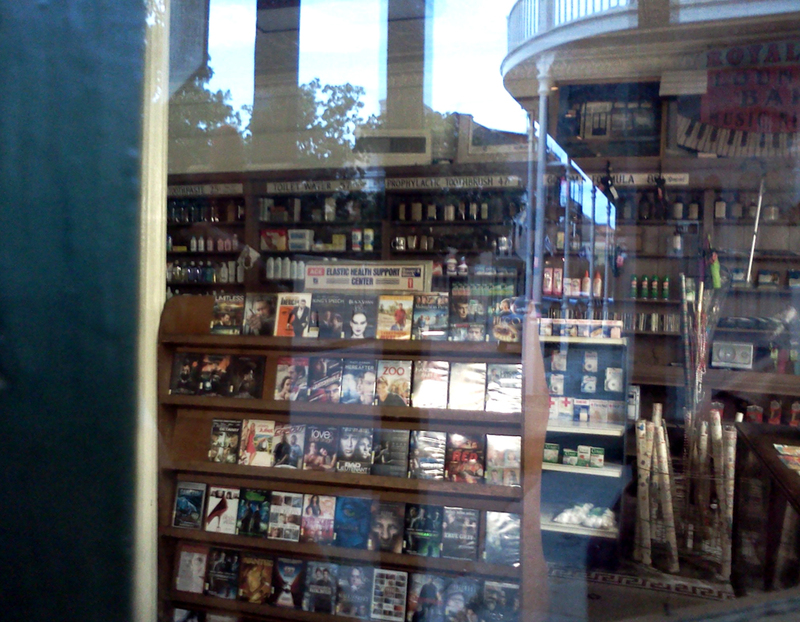 As one can see, the films up for grabs there are current. So I know someone is in there, from time to time. The lights were on, too. Hmm! Thus, there we go. The Royal Mystery Continues, even from five states away, two months later. So in and around looking forward to starting my life anew and permanently and successfully and settling down somewhere and not moving and saying goodbyes again, I am looking forward to continuing my ceaseless stalking of this place. A girl’s gotta have goals, ya know. Alright. Thank you, blog-o-verse, for waking my brain up by enduring the ramblings of a day-off lazy mind. I think I will go do some artwork to add to The Wall. You know, so I can eventually share it.